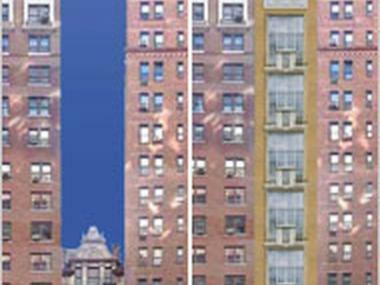 Upper West Side residents are worried about a plan to replace 330 W. 86th Street with a 17-story high rise. UPPER WEST SIDE — A group of Upper West Siders are battling to save a historic West 86th Street building that a developer wants to replace with a glass and steel high rise. Preservationists say losing the pint-sized building — it’s five stories tall — would take a big bite out of the neighborhood’s old-world charm. More than 100 residents concerned about the building’s fate attended a Tuesday night strategy meeting hosted by the Coalition for a Livable West, Landmark West! and other preservation groups. Residents "look at that little building and they’re appalled when they see the picture of what will replace it,” said Batya Lewton of the Coalition for a Livable West Side. The developer, Dark Horse Realty, wants to replace the building with a 17-story tower. A developer wants to replace 330 W. 86th Street with a 17-story high rise. The preservation groups want the city’s Board of Standards and Appeals to reverse a recent ruling that sided with the developer. They’ll get chance to weigh in when the BSA holds a public meeting at 10 a.m. on June 15 at 40 Rector Street. They’re also pursuing another tactic to preserve the neighborhood’s character. They want the Landmarks Preservation Commission to create a West End Avenue historic district. The West 86th Street building sits between West End Avenue and Riverside Drive. Melissa Elstein, secretary of the West 80s Neighborhood Association, said many people mistakenly think the area is already an official historic district. “People look at the character of the architecture and they assume it’s protected,” Elstein said. “They’re shocked that out-of-character development can occur."